Over the weekend I made two improvements to my workbench. The first was a new handle for the leg vise, and the second was a new board jack, or “sliding dead-man”. To be honest, both of these improvements were more for aesthetic reasons than for functionality. Don’t get me wrong, the new handle is longer and therefore offers more leverage, and the new board-jack is wider and offers more spaces for support, but neither additions were absolutely necessary for an increased overall functionality of the bench. The new handle project is something I detailed in my last post; the board-jack I made on Sunday afternoon. It was a very quick project. I still had a decent-sized section of board left over from making the leg vise, so I used the table saw to cross cut it to width, I planed it square and smooth, and sawed and chiseled out a channel at each end to ride along the rails on my work bench. It took just 15 minutes. In fact, it took longer bore the holes and apply the finish-boiled linseed oil and wax, than it did to make the part. On that topic, I used a 7/8 bit to bore out the holes rather than the traditional ¾ because I thought that I had a 7/8 dowel in my bucket. It turns out that I did, but it was only 6 inches long; so I will have to pick up another (or make one myself) next weekend. What prompted me to write this post wasn’t a board-jack, however. After every project, I will generally give the workbench area a cleaning. Most of that involves dust and shavings. My bench has a tool tray, which contrary to popular belief rarely gets dirty. It has a lot of tools, pencils, knives, and other items in it, but that is the reason it is on the bench. When I was taking a photo of the new board-jack, I accidentally snapped a photo of the cleared bench top. I didn’t notice it until I had walked out of the garage and was upstairs about to charge the cell phone. I then went back and took two clearer photos, the reason being to make a point about my tool tray. But as I was doing that, I noticed that my bench looks exactly like the “theoretical woodworking workbench” I have in my mind’s eye. Now, that theoretical bench will very likely appear a bit different from woodworker to woodworker, but at its core it would function the same. I have a firm belief that a woodworking bench needs to look like a woodworking bench to work properly. Of course you can get away with two sawhorses and a door, or a kitchen table, or what have you. Some people may even thrive on that approach. I can’t and I don’t. I’m a fan of conformity and uniformity, because those virtues exist in nature and in the man-made world for good reason. All good woodworking benches share the same features and they have for a long time. And though aesthetics aren’t always important to functionality, I’d much rather be working on a nice looking bench than two trashcans and an old door. So, yeah, it’s important to me that my woodworking bench looks exactly how I think a woodworking bench should look. 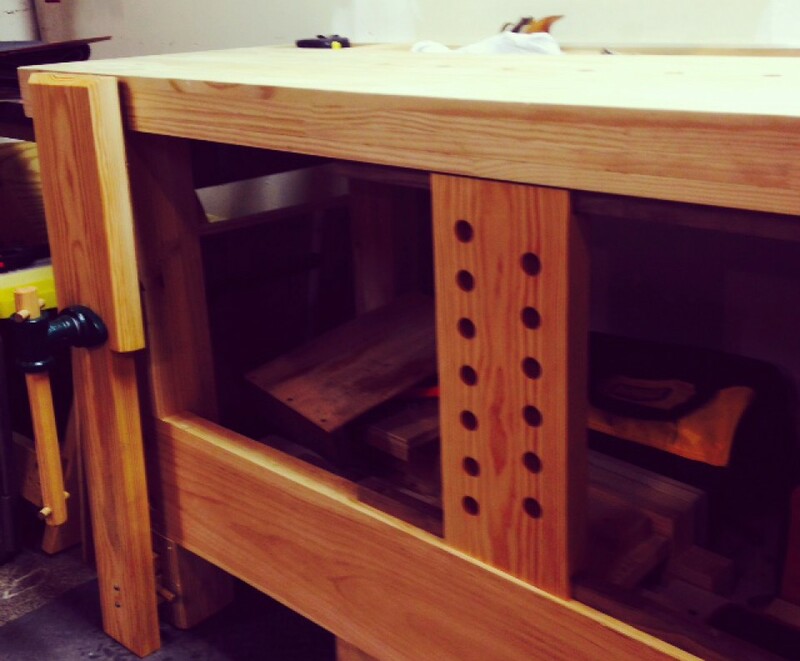 Making aesthetic improvements to a woodworking bench may seem silly, but it really isn’t. It’s good practice to incorporate both form and function. And while I would never go out and drop thousands of dollars on material for the sole reason that it would make a nice looking workbench, I am going to try to make what I have look as good as it possibly can. By billlattpa in woodworking, Woodworking Bench on November 23, 2015 . I agree with you–within reason. The bench should look like a woodworking bench, but I took a long time getting over the feeling that I couldn’t mar the bench top (when need required) and would hate to go back. On another subject entirely . . . Have you ever heard of a place called Polley Woodworking in NE PA? it’s a small sawmill for hobbyist woodworkers. If I remember what you’ve said about your location correctly you’d be a couple hours away. Prices seem worth my two hour drive to get to it so i wonder if you’ve had any experience with it. I beat the heck out of my bench top. Too much so sometimes. I usually plane it down every few months or so. Not much, just a few passes. I’ve heard of Polley Lumber, but I’ve never been there. If it’s where I think it is, it would be approximately 2 hours north of where I live, so you were right on the money there. If I need “specialty” lumber I go to Hearne Hardwoods, which is about an hour’s drive each way. They are not inexpensive, but they have everything you could ever hope for there. If you go to Polley, let me know how it is if you don’t mind. Tool trays catch a lot of flak, but I also like them. I fully understand the sentiment. Your two latest projects are fantastic practice and you get a better bench to boot. My experience with tool trays however is exactly opposite of yours. 🙂 Mine was/is always full of shavings and is PIA to clean. I have to sift out all of the tools and then sweep out the shavings. Not sure how I manage to fill it with shavings, but I always manage it. I’m not necessary an advocate of tool trays, because it’s really one of those things you have to try for yourself. At the same time, I would never discourage somebody from installing one either as I have seen some people do. As much as I like getting advice, reading the opinions of experts, etc. I think some lessons need to be learned and experienced on your own. I haven’t necessarily had a problem with shavings, but I do less stock prep by hand than you. Mine gets more dusty than anything. The trays are removable, which helps, but I’ve actually only removed them a handful of times. However, if I were to build another bench, I might not put a tray on it, or if I did, it would be attached to the back of the bench but not necessarily part of it if that makes sense. I was saying to another commenter that tool trays seem like they belong on a workbench. Not that they look cool, or what have you, but that they are just as much a part of a bench as a vice or dog hole. I won’t say they are completely necessary, but I would hardly call them useless, as some people have. Building a workbench, Building a hobby..
Is something rotting in the state of Ohio? Which is more difficult: Being a great musician or being a great woodworker? Sustainable wooden signs and fine hardwood boxes.